Mature bananas are necessary for good ripening results. Pulp temperatures between 58°- 64°F should be used when ripening. Temperatures below 56 °F will cause chilling injury. Ripener I Concentrate should be used in ARCO Ethylene Generators to produce ethylene for proper ripening. Maintaining 100 - 150 PPM of ethylene is adequate. 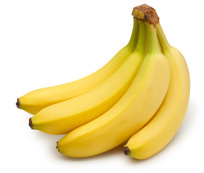 Bananas should be exposed to ethylene for 24 - 48 hours. Bananas should have ethylene applied for the appropriate amount of time, after which the room should be vented every 12 hours, or use "flow through" ventilation to keep CO2 levels low (below 1%). Maintain relative humidity between 90 - 95%. Keep bananas at 58°F after ripening for delayed shipment. Check Equipment Periodically. Use smoke candles annually to check rooms for tightness. Do not use ethylene generators in rooms less than 1500 cubic feet. The room must be as air tight as possible to prevent ethylene loss. This also prevents ethylene from entering unwanted areas (like other banana rooms or cold storage rooms holding ethylene-sensitive items). The room must be properly insulated to be able to control the temperature within a degree or so. The room must have adequate refrigeration capacity to accurately control pulp temperature. The room may need heating equipment in order to maintain proper room temperature in cold weather. The room must have adequate air circulation. Because uniform pulp temperatures throughout the load are essential for even ripening, the refrigerated air in the room must circulate at all times and uniformly throughout the load. For pressurized, forced air ripening rooms, this is typically inherent in the design. However, for non-pressurized rooms, the boxes of bananas should be "air stacked". That is, the boxes should be offset to allow the air to circulate among all the boxes since a non-pressurized room design will not pass air through boxes but around them. Avoid "chilling" or "cooking" the fruit. Bananas are very sensitive to temperatures. Chilling will occur if the fruit is subject to temperatures below 56°F (13°C) for several hours. It causes the peel to have a smoky, dull gray appearance. This may not show up for 18 to 24 hours after chilling occurs. Cooked bananas result from excessively high temperatures; avoid temperatures above 65°F (18°C). The peel will have a brown to orange appearance. The fruit may be soft and have a short shelf life. For best ripening results, humidity should be 85 to 95%. If the humidity is too low, install a humidifier; wetting the floor of the room with water may increase the humidity but may cause sanitation issues. Determine how in how many days the room of bananas will be needed; raise pulp temperatures to at least 58°F (14°C). Follow proven ripening schedules to adjust daily pulp temperatures. No chart however can account for the unique differences in every load of bananas that will be ripened. Frequent inspection of pulp softening and color change followed by temperature adjustments are vital to proper color achievement. Apply 100 - 150 ppm ethylene for a minimum of 24 hours during the initial phase of the ripening cycle. Fruit that is less mature may take an additional 24 hours of ethylene application. Please note that there are reports of bananas responding better to higher ethylene levels. While 100 ppm is the accepted standard to initiate ripening and ethylene production in bananas, there are some companies that require their ripening personnel to use 300+ ppm, saying that today's banana ripens quicker and more uniformly with this higher level. If you are having difficulty with bananas ripening properly, verifying current ethylene levels and then perhaps increasing them may resolve ripening issues. There are other factors that cause poor ripening, like inadequate humidity and immature fruit; ethylene is not always the culprit. When bananas are ripening, they release carbon dioxide (CO2) which will build up in a ripening room. The production begins as the fruit ripens enters the “climacteric” phase, or the period when bananas release ethylene and and have an elevated rate of respiration (along with a great deal of other physiological changes). Respiration involves the uptake of oxygen, the release of carbon dioxide, and the breakdown of starches. Carbon dioxide concentrations above 1% (10,000 ppm) will retard ripening, delay the effects of ethylene and cause quality problems. Therefore, it is recommended to vent rooms by opening the doors for 20 minutes every 12 hours, after the first 24 hours of ripening. Other venting methods are by automatic fan (either timed or sensor-based) or "flow-though" (constant) ventilation. Bananas also chill easily, as described above. If shipping on a mixed load at temperatures lower than 55°F (12.8°C), the it is highly suggested to use Pallet Covers to protect the fruit by holding pulp temperatures above 56°F (13°C).